The Mississippi Museum of Natural Science was founded in 1932. 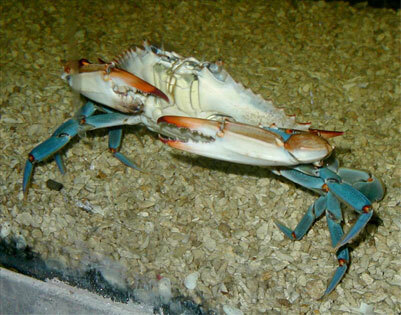 Located at LeFleur's Bluff State Park in Jackson, Mississippi, the museum's goal is to promote understanding and appreciation of the state's biodiversity. What’s behind the scenes at the Mississippi Museum of Natural Science can be just as interesting as the exhibits that the staff works so hard to put together for the 150,000 visitors who come through every year. The effort behind these displays is truly Herculean. 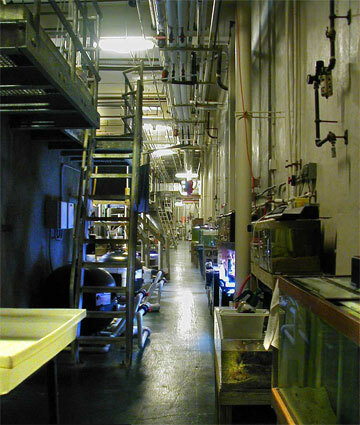 Immense, thick-walled tanks—the largest of which holds 16,000 gallons, thousands of feet of piping connecting each tank with its own filtration system, overhead illumination to simulate the proper amount of natural lighting at the water depths that are represented in each tank, and realistic environments that would fool even the most discerning fish are but the beginning. Proper feeding and medical care are also a major concern as are careful quarantine procedures for the introduction of new specimens. View these behind-the-scenes images here, then visit the museum and see the aquariums in a new light. 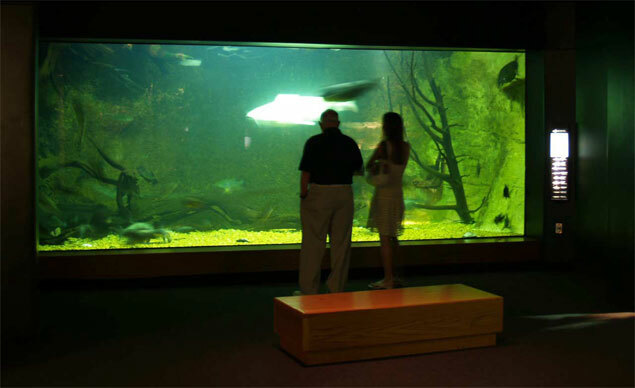 Easily the most favorite of the exhibits at the Mississippi Museum of Natural Science, the aquariums house fish and other animals from all aquatic environments from around the state. 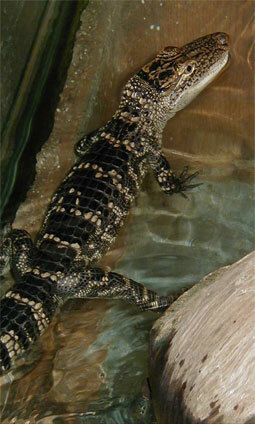 The long corridor behind the aquariums (above, left) gives the museum staff access to the tanks and water filtration equipment, and houses the many quarantine tanks for new specimens such as this young Mississippi alligator (above, right), and this delicate cup coral (below, left) and a defiant female blue crab (below, right), both from the Mississippi Gulf Coast. 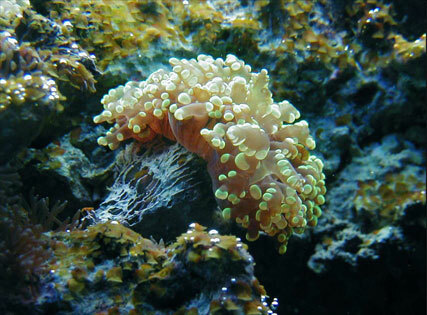 Click the cup coral photo below for a short QuickTime video. 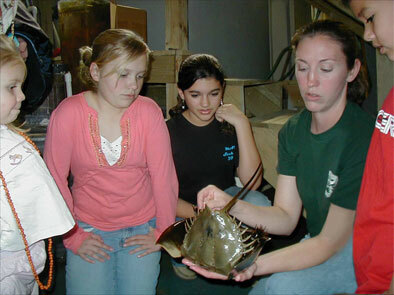 Stephanie Hawes Monistere (below, left) shows four young visitors a horseshoe crab, another sea creature from the Mississippi Sound that’s in quarantine behind the scenes. 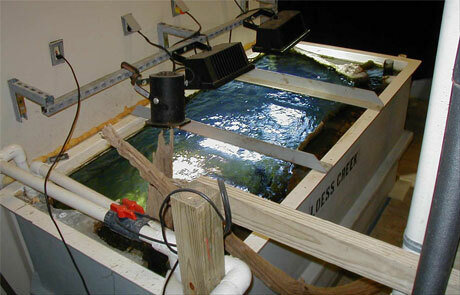 The exhibits staff at the museum puts forth a major effort to insure the accuracy of the exhibits, such as this representation of a typical creek (above, right) that would be found running through the Loess (pronounced lerse) environment of our state. 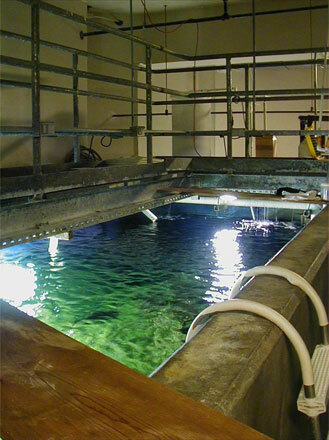 In order to maintain and clean the larger tanks, such as the Mississippi Sound tank (below, right), the staff needs to actually enter the tanks. Hence the access ladder seen at left (above, left) and the wet suits hanging on a rack (above, right). 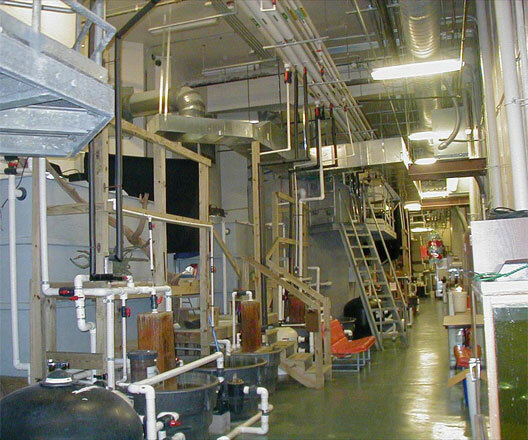 This mass of stairs, catwalks, pipes, and filters (above, left) is in complete contrast to the clean, sleek exhibit space that the museum’s visitors see. Not only must the water for the different environments be treated properly for pH and salinity as needed, but thorough filtration is also a major concern what with the size and number of the fish housed in the various tanks. Did you know? 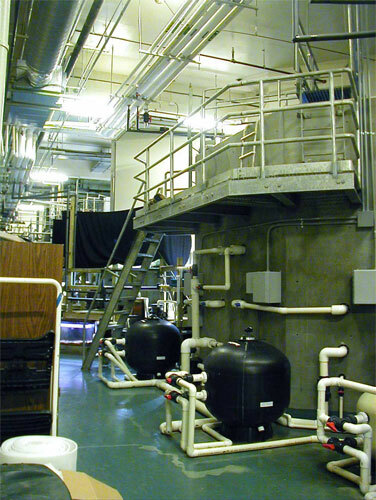 The museum has its own deep well, guaranteeing a consistent source of water for the aquariums. 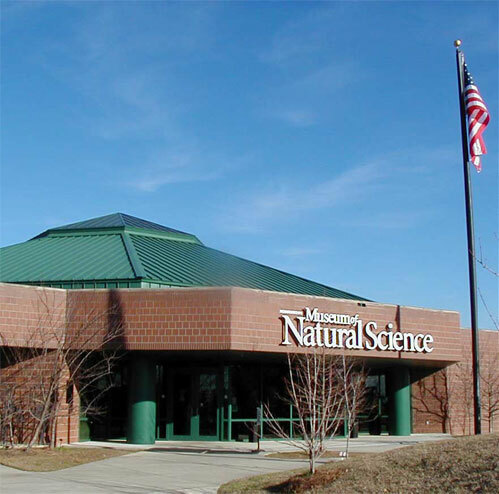 The Mississippi Museum of Natural Science is open Monday through Friday from 8:00 a.m. until 5:00 p.m., Saturday from 9:00 a.m. until 5:00 p.m., and Sunday from 1:00 p.m. until 5:00 p.m. For admission prices and other information, call 601-354-7303 or visit www.mdwfp.com/museum/.